Tacoma Little Theatre is honored to be representing the Puget Sound at the Washington State Community Theatre Association (WSCTA) Kaleidoscope festival with their performance of last season’s, The Pillowman, written by Martin McDonagh, and directed by Blake R. York. 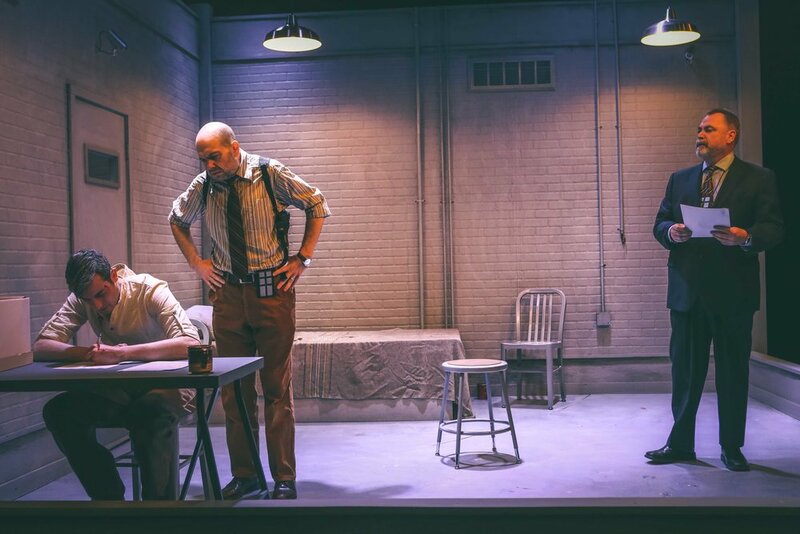 Tacoma Little Theatre’s festival production of The Pillowman features: Jacob Tice (Katurian), Andrew Fry (Tupolski), Christian Carvajal (Ariel), and Sean Neely (Michal). The Pillowman will present one special public performance prior to the festival, on Sunday, February 24th at 7:30pm. Tickets are $10.00 per seat for these special performances and they will be held at Tacoma Little Theatre. Tickets may be purchased by clicking here, or by calling our Box Office at (253) 272-2281. About Tacoma Little Theatre: Tacoma Little Theatre’s mission is to enrich our community by creating quality live theatre experiences. Tacoma Little Theatre (TLT) employs professional standards of excellence, utilizing the performing arts as a means of building community. Founded in 1918 as the Tacoma Little Theatre and Drama League, TLT is among the oldest community theaters in existence in the United States. About the WSCTA:The WSCTA Kaleidoscope Festival is a biennial event that brings theatres from all over Washington to participate in a competition with strict guidelines.If selected, shows will move to a regional festival (Washington, Alaska, Oregon & Idaho), with the final goal to make it to the American Association of Community Theatre Festival in Gettysburg, PA, which celebrates theatre across the country.Kaleidoscope 2019 will be held at The Princess Theatre in Prosser, Washington, February 28-March 2, 2019. Tacoma Little Theatre is excited to welcome the community to join us at our special Gala and Silent Auction celebrating our 100th Season. This special fundraising event will be filled with fine drinks, fine hors d’oeuvres, and fine entertainment. It is a momentous year as TLT turns 100-years-old and we can’t wait to share it with you. The evening will begin with a social hour and then move into the auditorium where staff and board members will present a sneak peek of each of the seven shows in our 100th season which include: The Foreigner, Bell, Book and Candle, Scrooge! The Musical, A Doll’s House, A Little Night Music, Laura, and Hay Fever. Throughout the course of the evening attendees will be bidding on silent auction items and enjoying musical entertainment from local performers. Tacoma Little Theatre’s 100th Season Opening Gala and Silent Auction will take place on Saturday, September 8, 2018 from 6:00pm-9:00pm. 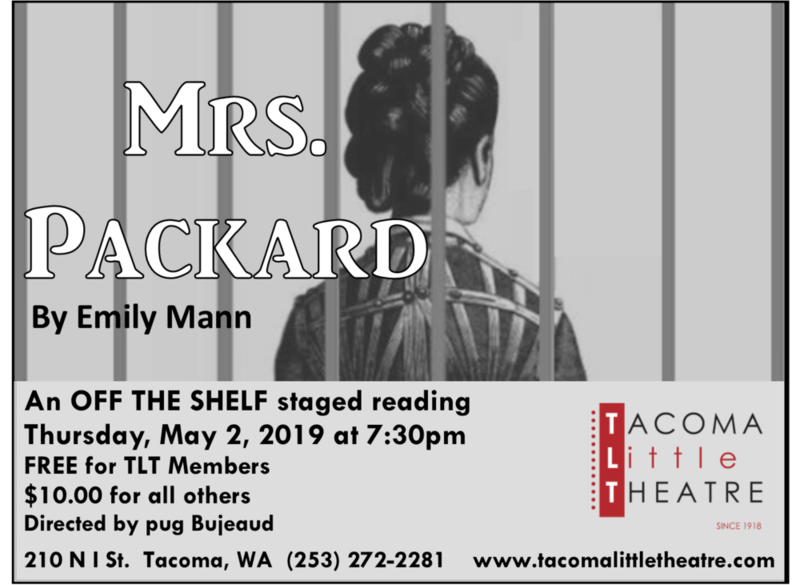 Tickets are $35.00 per person (includes hors d’oeuvres and one drink) and may be purchased by clicking here, or by calling our Box Office at (253) 272-2281. 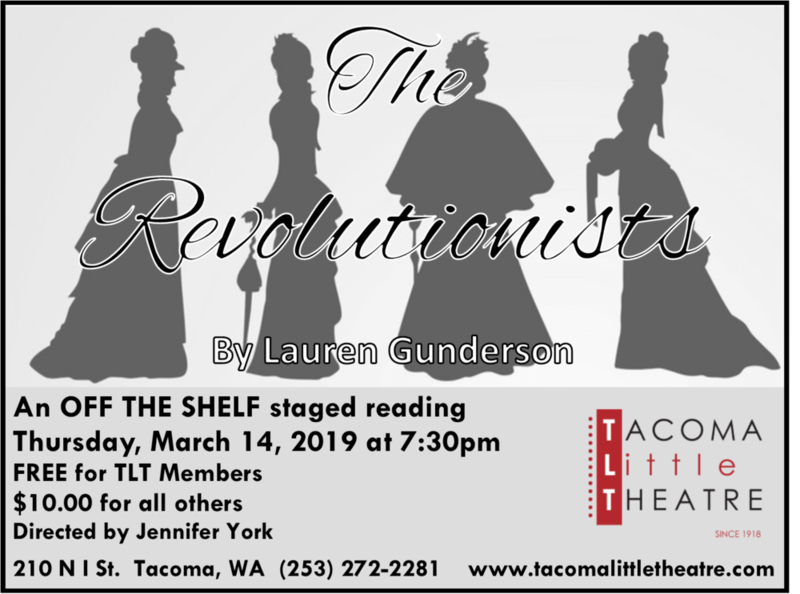 Tacoma Little Theatre's Off the Shelf program is excited to present Lauren Gunderson’s, The Revolutionists, directed by Jennifer York and featuring a powerhouse of Tacoma actors. 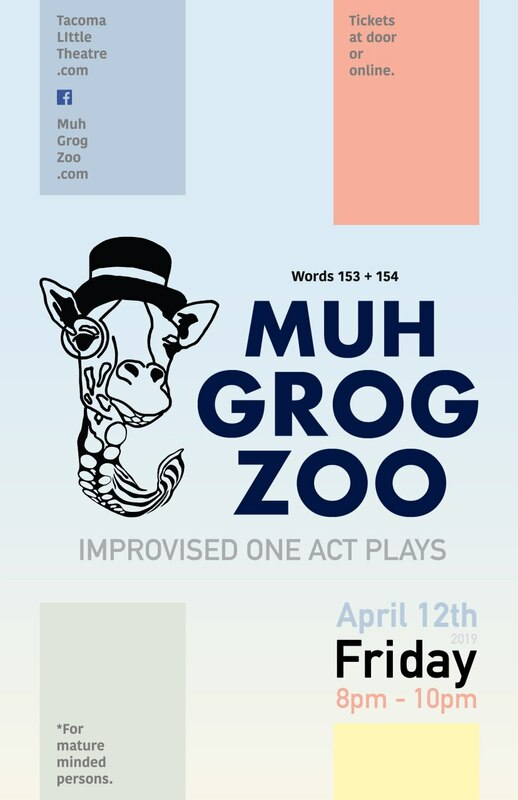 This production will play Thursday, March 14, 2019 at 7:30pm. Tickets for the March 14, 2019 performance at 7:30pm are $10.00 for non TLT Members, and FREE for those who are members. Tickets may be purchased online by clicking here, or by calling our Box Office at (253) 272-2281. Are you ready to get soaking “WET” with the Gritty City Sirens?! The Juices will BE flowing. Tacoma Little Theatre presents the swashbuckling adventure tale, The Fawn and the Black Oak, written by David Krafchick. This production will take place on Friday, May 11, 2018, and Saturday, May 12, 2018, at 7:30pm. The Fawn and the Black Oak is a swashbuckler play filled with hidden secrets, romance, ghosts, villainy, and the clashing of swords. Based on an event in English history, this story takes inspiration from the great swashbuckler films such as Captain Blood, and The Mark of Zorro. The story is that of Phillip Scarborough who has returned to reclaim his father’s title from an imposter. On his journey he is captured by the captain of the guard and taken out to be slain, when a dark figure saves him. His savior is Simon, The Black Oak, the African Pirate. In conversation they make a bond, train, and plan to restore Phillip as the Earl of Claremont and avenge Simon’s own experience with Gilbert Hunt, the impostor Earl. Phillips assumes a disguise and sets out for the castle where he meets Catherine Carrell, ward of the Earl, and destined to marry the Earl. Unbeknownst to Phillip, Catherine has her own reasons for wanting to see a change at the castle. Through a collection of characters more of the story is revealed leading to a startling revelation, and an epic sword battle. This reading features the talents of: Jacob Tice, Cassie Jo Fastabend, Nick Butler, Karen Christensen, Mason Quinn, Cody Wyld Flower, Johnny Neidlinger, and Jill Heinecke. Tickets for the performances are $10.00 for non TLT Members, and FREE for those who are members. Tickets may be purchased online at www.tacomalittletheatre.com, or by calling our Box Office at (253) 272-2281.